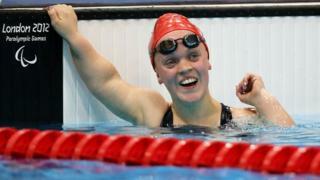 Listen to BBC Radio 5 live commentary as Great Britain's Ellie Simmonds wins her second gold of the Paralympics with a world record in the SM6 200m individual medley. The 17-year-old Briton, who defended her 400m freestyle title on Saturday, broke her own record, set in the heats, to win in three minutes 5.39 seconds. Team-mate and 2004 Athens gold medallist Natalie Waddon was third behind Germany's Verena Schott.